The Divine Liturgy is the common action of Orthodox Christians officially gathered to constitute the Orthodox Church. It is the action of the Church assembled by God in order to be together in one community to worship, to pray, to sing, to hear God’s Word, to be instructed in God’s commandments, to offer itself with thanksgiving in Christ to God the Father, and to have the living experience of God’s eternal kingdom through communion with the same Christ Who is present in his people by the Holy Spirit. The Divine Liturgy is always done by Orthodox Christians on the Lord’s Day which is Sunday, the “day after Sabbath” which is symbolic of the first day of creation and the last day—or as it is called in Holy Tradition, the eighth day—of the Kingdom of God. This is the day of Christ’s resurrection from the dead, the day of God’s judgment and victory predicted by the prophets, the Day of the Lord which inaugurates the presence and the power of the “kingdom to come” already now within the life of this present world. The Divine Liturgy is also celebrated by the Church on special feast days. It is usually celebrated daily in monasteries, and in some large cathedrals and parish churches, with the exception of the week days of Great Lent when it is not served because of its paschal character. As the common action of the People of God, the Divine Liturgy may be celebrated only once on any given day in an Orthodox Christian community. All of the members of the Church must be gathered together with their pastor in one place at one time. This includes even small children and infants who participate fully in the communion of the liturgy from the day of their entrance into the Church through baptism and chrismation. Always everyone, always together. This is the traditional expression of the Orthodox Church about the Divine Liturgy. Because the Divine Liturgy exists for no other reason than to be the official all-inclusive act of prayer, worship, teaching, and communion of the entire Church in heaven and on earth, it may not be considered merely as one devotion among many, not even the highest or the greatest. The Divine Liturgy is not an act of personal piety. It is not a prayer service. It is not merely one of the sacraments. The Divine Liturgy is the one common sacrament of the very being of the Church itself. It is the one sacramental manifestation of the essence of the Church as the Community of God in heaven and on earth. It is the one unique sacramental revelation of the Church as the mystical Body and Bride of Christ. As the central mystical action of the whole church, the Divine Liturgy is always resurrectional in spirit. It is always the manifestation to his people of the Risen Christ. It is always an outpouring of the life-creating Spirit. It is always communion with God the Father. The Divine Liturgy, therefore, is never mournful or penitential. It is never the expression of the darkness and death of this world. It is always the expression and the experience of the eternal life of the Kingdom of the Blessed Trinity. 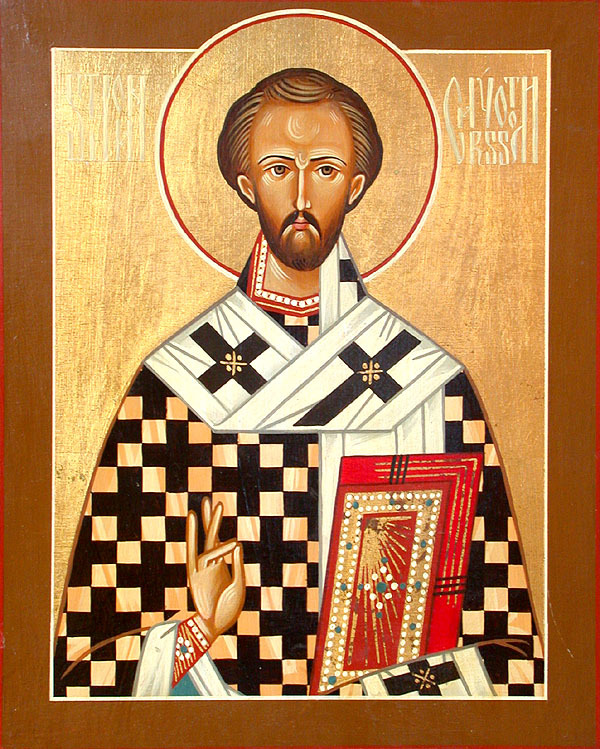 The Divine Liturgy celebrated by the Orthodox Church is called the Liturgy of Saint John Chrysostom. 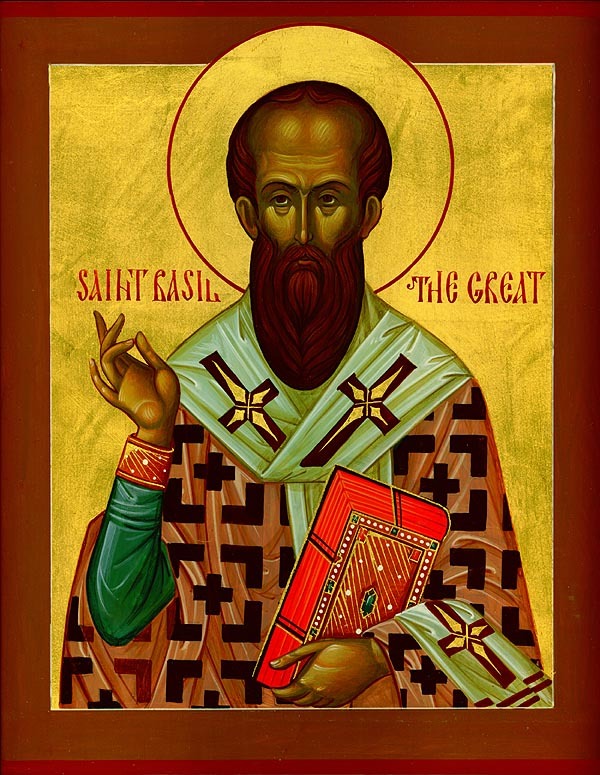 It is a shorter liturgy than the so-called Liturgy of Saint Basil the Great that is used only ten times during the Church Year. These two liturgies probably received their present form after the ninth century. It is not the case that they were written exactly as they now stand by the saints whose names they carry. It is quite certain, however, that the eucharistic prayers of each of these liturgies were formulated as early as the fourth and fifth centuries when these saints lived and worked in the Church. In the New Testament Church Jesus Christ is the Living Word of God, and it is the Christian gospels and apostolic writings which are proclaimed and meditated at the first part of the Divine Liturgy. And in the New Testament Church, the central saving event is the one perfect, eternal and all-sufficient sacrifice of Jesus Christ, the one great High Priest who is also the Lamb of God slain for the salvation of the world, the New Passover. At the Divine Liturgy the faithful Christians participate in the voluntary self-offering of Christ to the Father, accomplished once and for all upon the Cross by the power of the Holy Spirit. In and through this unique sacrifice of Christ, the faithful Christians receive Holy Communion with God.The Divine Liturgy has two main parts. The first part is the gathering, called the synaxis. It has its origin in the synagogue gatherings of the Old Testament, and is centered in the proclamation and meditation of the Word of God. The second part of the Divine Liturgy is the eucharistic sacrifice. It has its origin in the Old Testament temple worship, the priestly sacrifices of the People of God; and in the central saving event of the Old Testament, the Passover (Pascha). For centuries it was the practice of the Church to admit all persons to the first part of the Divine Liturgy, while reserving the second part strictly for those who were formally committed to Christ through baptism and chrismation in the Church. Non-baptized persons were not permitted even to witness the offering and receiving of Holy Communion by the faithful Christians. Thus the first part of the Divine Liturgy came to be called the Liturgy of the Catechumens, that is, the liturgy of those who were receiving instructions in the Christian Faith in order to become members of the Church through baptism and chrismation. It also came to be called, for obvious reasons, the Liturgy of the Word. The second part of the Divine Liturgy came to be called the Liturgy of the Faithful. Although it is generally the practice in the Orthodox Church today to allow non-Orthodox Christians, and even non-Christians, to witness the Liturgy of the Faithful, it is still the practice to reserve actual participation in the sacrament of Holy Communion only to members of the Orthodox Church who are fully committed to the life and teachings of the Orthodox Faith as preserved, proclaimed and practiced by the Church throughout its history. In the commentary on the Divine Liturgy which follows, we will concentrate our attention on what happens to the Church at its “common action.” By doing this we will attempt to penetrate the fundamental and essential meaning of the liturgy for man, his life and his world. This will be a definite departure from the interpretation of the Divine Liturgy which treats the service as if it were a drama enacted by the clergy and “attended” by the people, in which each part stands for some aspect of Christ’s life and work (e.g., the prothesis stands for Christ’s birth, the small entrance for the beginning of his public ministry, the gospel for his preaching, the great entrance for Palm Sunday, etc.). This latter type of interpretation of the Divine Liturgy is an invention, which, although perhaps interesting and inspiring for some, is nevertheless completely alien to the genuine meaning and purpose of the Divine Liturgy in the Orthodox Church.